Hailed by Time as one of the world's hundred most influential people, Jeffrey D. Sachs is renowned for his work around the globe advising economies in crisis. Now a classic of its genre, The End of Poverty distills more than thirty years of experience to offer a uniquely informed vision of the steps that can transform impoverished countries into prosperous ones. Marrying vivid storytelling with rigorous analysis, Sachs lays out a clear conceptual map of the world economy. Explaining his own work in Bolivia, Russia, India, China, and Africa, he offers an integrated set of solutions to the interwoven economic, political, environmental, and social problems that challenge the world's poorest countries. 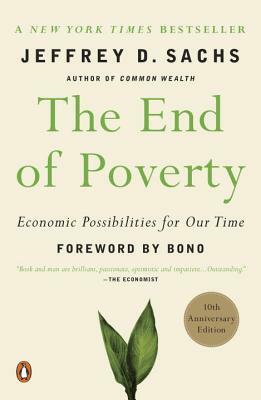 Ten years after its initial publication, The End of Poverty remains an indispensible and influential work. In this 10th anniversary edition, Sachs presents an extensive new foreword assessing the progress of the past decade, the work that remains to be done, and how each of us can help. He also looks ahead across the next fifteen years to 2030, the United Nations' target date for ending extreme poverty, offering new insights and recommendations. Jeffrey D. Sachs is the Director of the Earth Institute at Columbia University, as well as Quetelet Professor of Sustainable Development and Health Policy and Management. He is Special Advisor to United Nations Secretary-General Ban Ki-moon on the Millennium Development Goals. He has twice been named among Time Magazine's 100 most influential world leaders. He was called by the New York Times, "probably the most important economist in the world," and by Time Magazine "the world's best known economist." A recent survey by The Economist ranked Sachs as among the world's three most influential living economists of the past decade. His other books include Common Wealth, The Price of Civilization, To Move the World, and The Age of Sustainable Development.